First off: WOW! 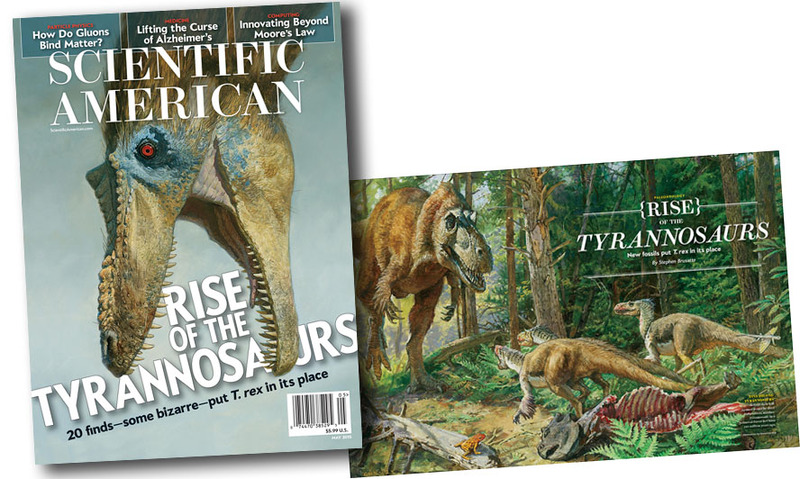 Thanks so much for your generous response to my new video "TYRANNOSAURS: Behind the Art," which documents the illustrations I just did for the May 2015 article in Scientific American Magazine. Here's the trailer on YouTube if you missed it. In this post, I would like to cover your desktop with preliminary sketches. The article by scientist Stephen Brusatte mentions a number of early tyrannosaur relatives: Kileskus, Guanlong (both with impressive head ornaments); Yutyrannus and Dilong; and the dwarf arctic Nanugsaurus. Any of these are candidates for the title spread. I use gouache, a good medium for rapid visualizing in color. I indicate headline and text blocks with a pen to try to imagine the final effect of the page. 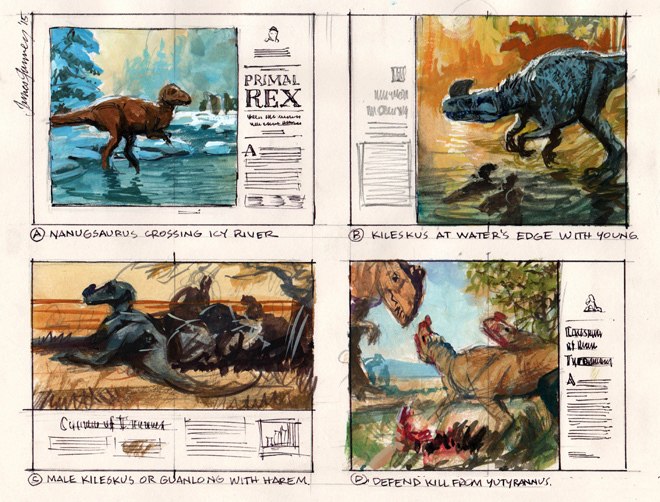 Everyone likes the idea of the multiple-predator interaction, shown in the sketch at the lower right. Freelance Art Director Juan Velasco and SciAm's Design Director Michael Mrak suggest expanding the art to fill the entire spread, with allowance for the headline to reverse out of the art. I do these black watercolor pencil sketches to explore various points of view, almost as if I was a movie director planning a shot. I paint this small comprehensive sketch (5 x 7.5 in) in casein to give the art director something more complete that he can use for the layout. We decide to stage the scene inside a forest rather than in the open plains. 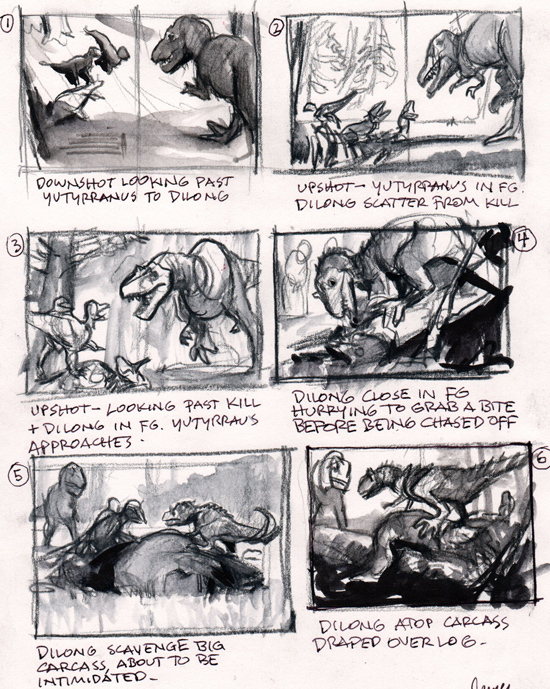 The art director wants to make sure the little Dilongs don't get too close to that gutter, and also that the back of Yutyrannus isn't tangent to the top of the frame. Mindful of the risk of getting carried away with too much detail and middle tones, I remind myself to keep it simple. 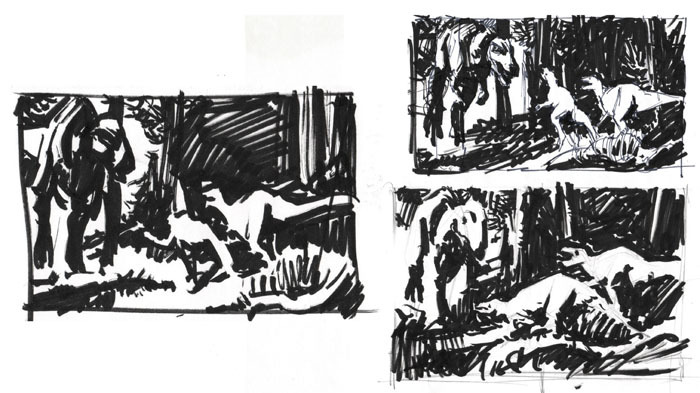 These black and white thumbnail sketches, sketched with a pigmented brush marker , force me to interpret the image to its tonal essentials. 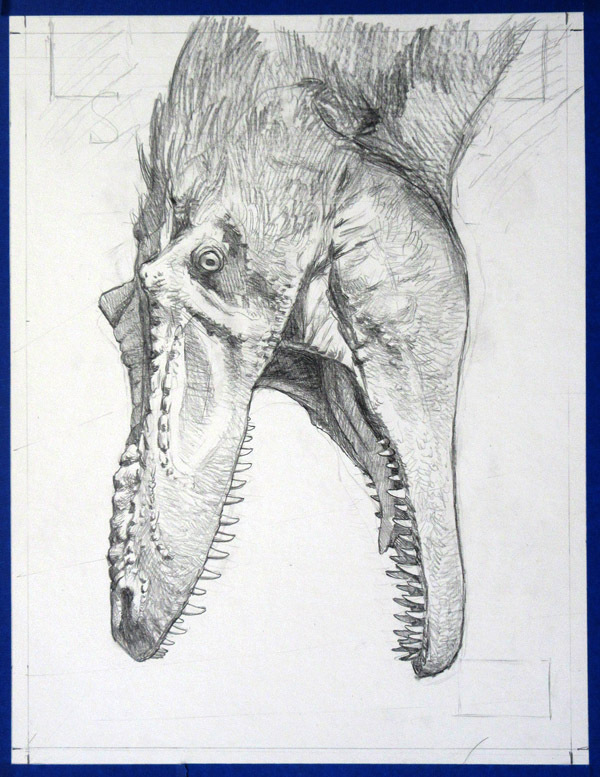 Meanwhile, for the cover, we want to feature Qianzhousaurus, aka "Pinocchio Rex," a strange long-snouted tyrannosaur that happens to be one of the author's most celebrated finds. As fun as any of these would be to paint, none of them are really striking or simple enough in their design. Design director Michael Mrak proposes that I show the face up close with a simple background, maybe coming into frame from above. I paint these two sketches in casein . The one on the left gets the magazine's approval, with the suggestion of flopping it left to right. Dr. Brusatte sends me more photos and drawings of the skull and asks me to reduce the convexity of the ventral end of the maxilla and to reduce the proportional depth of the skull. I do the pencil drawing directly on the heavyweight illustration board, using a fairly soft pencil . Note the light indication of the "S" of "SCIENTIFIC AMERICAN" to be sure I've got room for the graphics. The rest of the pencil work is darker than I might usually use, because I want it to show through the thin passages of paint. I seal the drawing with workable fixatif and acrylic matte medium before heading into the final paint. 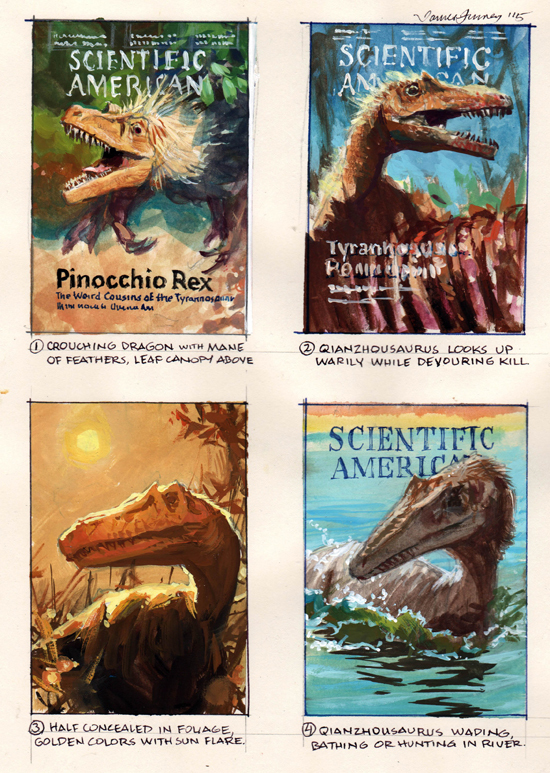 And here are the finished illustrations in context. You can watch all the steps up close and in action in the 40-minute full-length video workshop available now from Gumroad (credit cards) or Sellfy (Paypal). 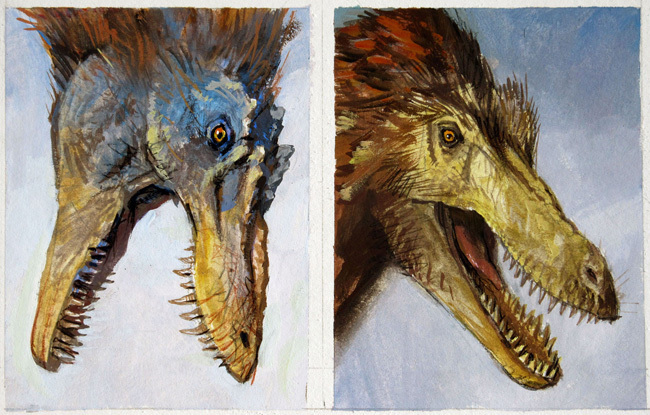 Yesterday's post with stills from "Tyrannosaurs: Behind the Art"
Be sure to pick up a copy of the May issue of Scientific American, "Rise of the Tyrannosaurs"
Bought mine today, can't wait to watch it! I went and bought the video today. 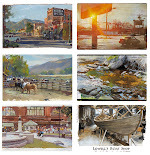 The video was very nicely done and it cleared up many things for me about oil painting. 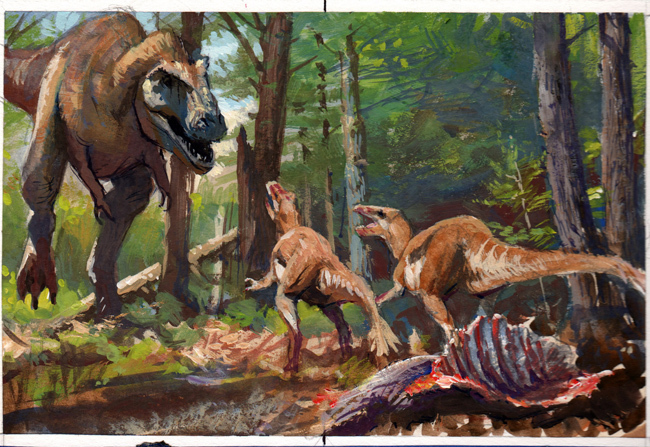 Also, it was great to see a video putting that much time on the actual painting process. Quite a many of non-computer tutorials go almost straight to the finished piece. There's one thing I'm curious about; how long did the whole assignment (from the brief to delivering finished paintings) take? I guess quite a lot, considering all the science and preparation involved? 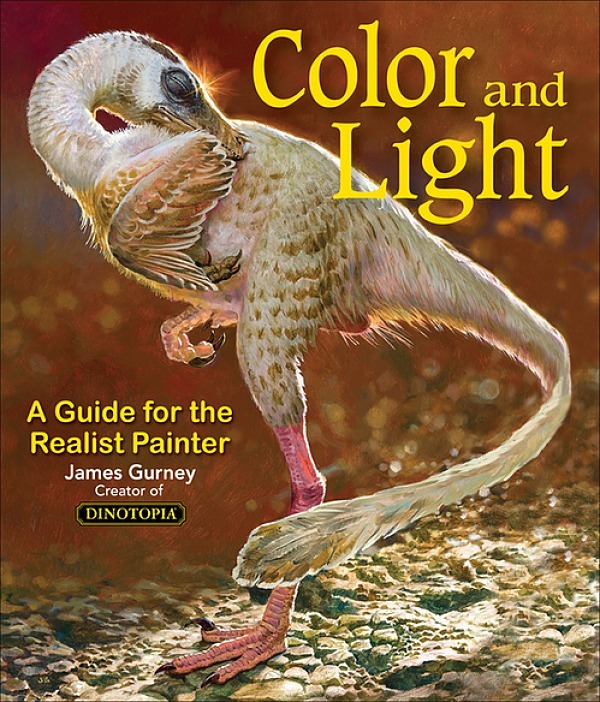 All in all, thank you for the video and your books (Dinotopia & the instructional ones). They continue to inspire me every time I open them. Hi, Markku. Thanks for buying the video. That's a great question. This job took a total of six weeks from first call to delivery. That's a fairly generous deadline as magazines go. I have done magazine illustrations with a week or or even less from assignment to delivery. In the past, I've been called in the last few days of someone else's deadline to rescue a job. On the other extreme is National Geographic, which has kept assignments open for as much as a whole year. Regardless of the time allotted for the entire assignment, more than half of the timeframe is spent with the research and sketches. In the case of a cover, such as this one, about two weeks were required for approvals, so that time has to be built into the planning. Being absolutely reliable about delivering on deadline is essential for magazine work. If I'm busy or if there's not enough time, I have turned down jobs. "The rest of the pencil work is darker than I might usually use, because I want it to show through the thin passages of paint..."